How can we develop Ala-Igbo? An address by Okezie Victor Ikpeazu PhD, Governor of Abia State and Chairman South-East Economic Hub, at a town hall meeting with Igbo Business Community in Lagos. 1. My brothers and sisters, permit me to share a story with you. Recently I attended a ceremony of an illustrious Igbo leader, somewhere outside Ala-Igbo, while at the event, a brother walked up to where I was and said to me: Governor, our people (Ndigbo) are trapped outside our lands something must be done to get them back home. Our elders have refused to go home, even after retirement. Our towns and cities are deserted. Our people are now organizing traditional marriages of their children outside our land. Something has to be done. 2. My mind told me this brother spoke to me on this, not because I am Governor of Abia State, but he must have read in the media that my colleagues in the South-East asked me to be the chairman of the South-East Economic Hub. That was why when this opportunity came for me to be with you here to share ideas on how to develop Ala-Igbo, I gladly accepted it. 3. Seated in this hall tonight are hard working Igbo businessmen and women who have contributed immensely in the development of the city called Lagos, through you businesses and investments here. As you know, Governments are going abroad to look for foreign investors to come and invest in their states, and I have come here tonight as one of you to ask us a question: How can we develop Ala-Igbo? 4. As businessmen, I know you have your answers to this, but before you come up with your answers, which I know one of them will be insecurity, permit me to remind you that, you will agree that there is a relationship between unemployment and violent crimes like kidnapping and armed robbery as it is in Ala-Igbo, and elsewhere including Lagos. The high unemployment rate among the nation’s youth has huge implications for crime and violence. 5. There are two key reasons for high unemployment among our youth: absence of relevant skills and lack of jobs. 6. As you are aware, state governments in Igbo land are the highest employers of labor and now the governments appear to be fully stretched in the light of current economic realities. To succeed in the mission to drastically reduce youth unemployment, we need support from Igbo entrepreneurs and businessmen in Lagos. Looking around this room, I can count in my head over 100,000 jobs created in Lagos by the great men and women seated here. Naturally, I have also been asking myself what if these jobs were created in Igbo land. Will it not drastically reduce high crime rate in the east? 7. Paradoxically, in the past when we appealed to Igbo entrepreneurs to invest in Igbo land their principal worry was security. So we have a problem: Igbo entrepreneurs will not invest in Igbo land to create jobs because of high crime rates in Igbo land caused mainly by unemployment in Igbo land. So who will break this ugly cycle that has persisted for so long and ensured that Igbo land is not what it is today? 8. As a result of the security concerns of Ndigbo of Lagos, in addition to other reasons, many of our leading lights refused to relocate to the east even after over 70 years of successful navigation of God’s world. Since the days of the great Zik of Africa, M.I Okpara, Jaja Nwachukwu etc, those wishing to meet Igbo leaders no longer come to Ala Igbo to see them. They now travel to Lagos and Abuja to consult Igbo leaders. Igbo leaders have also deserted Enugu. The question therefore is why is our case different from that of other major ethnic groups in Nigeria? If you want to see a Yoruba leader you go to Ibadan or somewhere in south west towns. Same applies to the northern. If you need them you go somewhere in Kano or Kaduna where they live with their people to see them. By so doing you will find out how the roads are, support the rural economy and further bring govt closer to the people. 9. In the same vein, because Ndigbo live outside Ala-Igbo we are counted during census and registration for voting, we succeeded in increasing the population and allocation to those areas. Of course the federal government will support high population areas before others. Most of us even don’t have voters cards in Igbo land and only acquire one when we decide to come home and contest for one office or another. To worsen our security challenges, as we are coming we bring thugs and other miscreants to Igbo land to protect us and campaign for us without minding the influence of these imported thugs on the local youths. We also advertise wealth so negatively that our youths feel that all they need to succeed is to travel to Lagos or Abuja. More often that not, these youths end up under Lagos/Abuja bridges where they acquire all sorts of criminal indoctrination. When they have fully graduated they return to the east and practice their evil skills. 10. It is not enough to complain about insecurity in the east and use that as excuse for not investing in Igbo land or relocating to Igbo land post retirement. Everyone of us here can contribute to improve security in Igbo land by investing in Igbo land to create jobs for our youths as well as returning home to serve as positive role models to our young minds. We need you to mentor the young and share experiences with them. We also need you to be close enough home to advice government based on realities in Igbo land as against text book postulates and external experiences that are not relevant to our peculiar challenges..
11. The key to security and economic development of Alaigbo is in your hands: invest in Igbo land to create jobs and remove our young people from prison rows. Our state governments are ready to offer whatever support that you need, including land, tax concessions and provision of relevant infrastructure that will help your business thrive and grow. You may argue that there is a ready market where you are currently but permit me to remind you that the market follows the source. 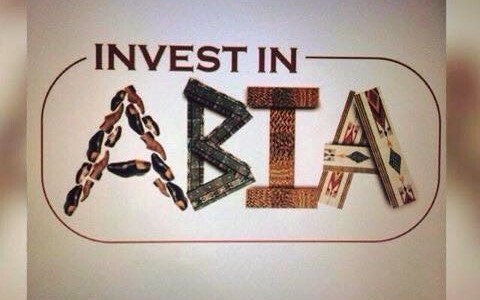 A time was, and I believe it still happens, when people travel from Lagos, Abuja, Cameroon, Togo etc to Nnewi to buy vehicles spare parts Similarly, people where coming to Aba from all over the country and far away West African countries to buy made in Aba products. 12. My brothers and sisters, we need you to invest in Igbo land to create jobs that will take our youths off crimes and reduce incidences of violent crimes like kidnapping that have led to many of you being trapped outside Igbo land even at glorious old age..